BART is updating its bicycle plan [PDF] and setting a new goal to double the rate of passengers who bike within ten years, largely by expanding secure parking and possibly relaxing its restrictions on bike access to trains and stations. The agency is asking the public to submit comments on the draft plan until May 27. Currently, four percent of passengers get to and from BART stations by bike. To bolster that rate, the agency is looking to roll out a targeted expansion of secure parking facilities, as well as reduce “blackout periods,” when bikes are banned on rush hour trains, and revisiting its ban on bikes on escalators. 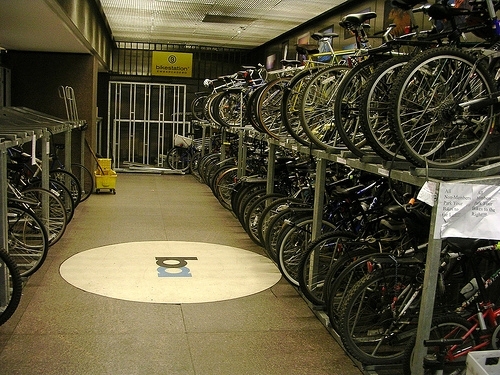 The agency even developed its own computer model, known as the Bike Investment Tool, to project the ridership increases derived from different types of upgrades at each station. Overall, the plan has been widely praised: the SF Examiner called it a wise strategy to reduce emissions and “encourage smarter, denser growth around existing stations and new extensions” by reducing demand for car parking. Bike advocates said they’re encouraged by the agency’s commitment to installing more secure bike parking, and that reducing blackout periods is also key to boosting ridership for those who need it. San Francisco Bicycle Coalition Executive Director Leah Shahum said the organization “commends the BART leadership for stepping up their commitment to encouraging more bicycles on and to the BART stations. By implementing this new plan, BART is sure to draw even more new customers and lessen its overall cost per rider by encouraging more bike-transit trips replacing car-transit trips.” The SFBC is calling on members to urge BART staff to eliminate blackout periods. Steve Beroldo, BART’s Bike Program manager, said staff is “going to look very hard at the blackout periods, see if there are some where we can narrow them down a little bit and do some experiments to see what’ll happen if more people are on board.” He and advocates noted that Grace Crunican, the agency’s new general manager, seems more willing to experiment with changes than previous management. BART also expects to roll out new train cars with more dedicated bike space in 2017. “The surveys that BART has done show that half the people who bring their bikes on BART bring them on because of the lack of secure parking at the station,” Rivera said. As a model, she pointed to the wildly successful, valet-attended Berkley Bike Station outside Downtown Berkeley BART, and other rack installations inside paid areas. Oakland’s 19th Street BART station is also set to get a bike station within a year. 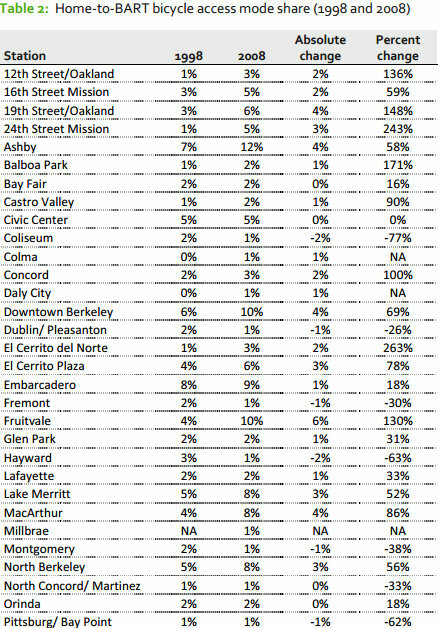 Home-to-BART bicycle access mode share by station. See the rest in the draft plan ##http://www.bart.gov/docs/BART%20bike%20plan_DRAFT_05-05-12_body.pdf##PDF## on pg. 11. Tom Radulovich, a member of the BART Board of Directors, said he hopes to see more measurable commitments to station improvements and policy changes included in the plan. “Too often, plans are a vague statement of intentions, and less often a road map,” he said. Beroldo said the plan is intended to provide “high-level” guidance for ongoing improvements, like parking expansions, which the agency is “actively” making. Demand is clearly high. The 65 bike rack spaces recently installed inside Oakland’s 19th Street station and the 30 racks at 12th Street quickly filled up, Beroldo said. Still, he said he’s eager to move forward with more. The plan also recommends “re-visiting” the agency’s prohibition of bikes on escalators. Currently, the agency requires cycling passengers to use elevators or carry their bikes on stairs, which the plan notes “can be challenging, particularly for children, elderly, and disabled cyclists.” Radulovich said he supports lifting the ban. Radulovich pointed out that people regularly take their bikes on escalators on many transit systems “without signs of carnage,” and that the ban seems to be a case of “the insurance department writing rules that don’t actually make a lot of sense.” No other American transit system expressly allows bikes on escalators, but systems in many other countries do, and Radulovich noted some American systems don’t expressly prohibit it, either. Other recommendations in the plan include evaluating and increasing automobile parking fees, which the plan says have “a profound impact on bicycle access rates”; advocating for other agencies to make bikeway improvements on connecting routes; and improving signage for wayfinding. Beroldo said staff will present a final plan to the BART Board on June 14, and that it should be adopted by the end of that month. Check out the draft plan [PDF] for more, as well as a plethora of data on bike parking and usage. The public can submit comments to BART for the remainder of the week by emailing bikes@bart.gov. 32% of BART riders walk from home to the stations? Tell me again why we need to expand into the nether-regions of the Bay Area and not do infill stations? Banning bikes on escalators but not BART staff wheeled maintenance carts makes clear the attitude toward customers. Cost is right, but also out-liers have been paying taxes and feel they are “owed” a station. And yes, I would also like to see # by station. Honestly, as someone who brings their bike on BART nearly every day, black out periods are necessary at some times. I think they could certainly be shortened, such as when I try to hit the last pre-commute hour train in the morning, and it’s not nearly full. I’m sure those next few trains aren’t much more crowded either. But the few days that I don’t ride and go during peak hours, it would be a total pain to have a bunch of bikes on there too, it’s just too crowded. Unless they can increase capacity or give us cyclists a more space-efficient place to put our bikes on the train (or have cars just for bikes, ala Caltrain), I think the some blackout time is necessary. However, get rid of the escalator ban! It’s so dumb, and frankly, it’s safer than bringing your bike up a winding staircase where around each turn you risk clocking the person behind you if they’re too close. If you’re carrying your bike on the escalator, you just go straight and don’t risk clipping someone. Calling short terminals “crossover stations” just shows BART’s institutional refusal to behave like what it is–just another subway. Short turning trains is common on most systems. They already do this at both 24th and Montgomery. to get more trains back to trhe East Bay in rush hour. What they should be doing is creating a turnback pocket just beyond the portal from Lake Merritt where there is abandoned RR ROW available. Reconfiguring the stub at Daly City so reversing trains needn’t cross opposing tracks would increase reliability and save time. Another candidate for correcting poor track/platform layout is Bayfair where millions were wasted on a small yard south of the station without adding a stub track to facillitate shuttles to/from Dublin or Fremont. • Without making room for bike carriage, they’re doing it wrong. I need my bike at both ends, for starters. Also, when the Bikes on Board project crunched the numbers for Caltrain it found that storing bikes was more costly than removing seats to make room for more bike carriage. Eventually Caltrain did just that and built ridership. BART should do the same. The idea of smarter, denser growth around BART stations has been talked about for decades, but what they actually build has put parking lots and garages closer than walkable amenities. Let’s see something more than talk this time, eh? Today, there’s no restriction on the Richmond-Fremont trains anytime of the day, so someone can take their bikes from Hayward to Berkeley no problem, even though they cannot board the trains that are destined to Daly City during morning peak hours. However the same trip to Berkeley cannot go from Dublin or from Walnut Creek, even if they can immediately transfer to the Richmond train at the earliest opportunity. I think for these lines the restriction should be lifted at least to the station where riders with bike can transfer. That way you can get more suburb to suburb ridership that would be more likely of needing bikes on both ends of the BART trip. What does it matter that there’s a bike ban on escalators since it’s never enforced? I have yet to see anyone EVER been confronted by BART for taking a bike on an escalator and I see it every time I ride BART. I’ve had exchanges with BART about the escalator issue and their answer is that no other transit system allows bikes on escalators. When I described what you did Zack, or mentioned that it’s more dangerous to make someone walk upstairs with a bike instead of standing still on an elevator, they claimed it was a “liability issue” if someone were to fall with their bike. When I asked “what would happen if someone fell on the stairs? Don’t you think it would be just as dangerous?” They went silent. In regards to bikes on BART itself, I was told that bikes aren’t allowed on during commute hours because they take up as much room as 4 passengers. When I asked why people with excess luggage or double-wide strollers have no commute hour restrictions, but people with multi-modal transportation needs are restricted, again, radio-silence. It’s clear that BART has no clue how to deal with bikes and is unwilling to make accommodations. It’s great to see a bike plan and a goal, but the last time they re-evaluated their policies for bikes, they adopted ZERO recommendations. ZERO. I hate to be a pessimist, but I won’t be holding my breath on the BART bike plans. I think I’ll just move to Portland where they actually get it. It’s still nice to get the official recognition that, as a cyclist, you’re not a second-class citizen expected to hump a bike akwardly up an enormous set of stairs. Further, there definitely are some people (I know a bunch) who reluctantly take the stairs instead of the escalator because of the ban, and this in term disinclines them from wanting to take Bart with their bike. Removing this ban would definitely make these people’s lives easier. Good suggestion, Andy. I also question the need for bikes to be banned as of Millbrae on all trains in the inbound direction in the morning. Perhaps this could be modified, ie. as of South San Francisco or another station based on typical passenger loads (on some of the trains in the black-out timeframe). My own experience riding BART at peak periods is limited, but it seems to me that the last car of long trains is less crowded – and, if bikes are to be allowed during black-out periods in some manner, perhaps this is the one car where they ought to go (or the last two cars…). I got yelled at (over the intercom) the 2nd time I did it–I was new to BART Biking and didn’t know! (Probably got yelled at the 3rd time, too and that time I could actually hear what they were saying on the intercom.) I haven’t done it since. BART’s new GM, Grace Crunican, and Steve Beroldo, Manager of Access programs, are two of many bike-friendly BART staffers who support expanding bike access throughout the BART system, but there are many more cyclists and allies like them at BART now. The BART Bicycle Advisory Task Force (BBATF) on which I serve has seen a dramatic increase in the amount of support and communication it has received from BART staff over the past year, and this has greatly improved the BBATF’s ability to do its work. We have literally spent many hours working with the designers and BART staff to refine the bike-carrying aspects of the new Bombardier cars and that work is far from finished. The draft Bike Plan, despite its policy “blind spots” (not really considering blackout periods, for example) represents a significant step forward in making BART more bike-friendly and accessible. I take my bike on BART escalators all the time because doing so with my loaded Peugeot mixte is faster as well as safer for my fellow passengers than when I try to carry the heavy and ungainly bike up or down stairs–even those with stair channels. The bike is far more stable on a moving escalator (with the front wheel turned sideways and my hand on a brake) than it is when I drag it up the stairs or the bike is swinging as I try to carry it. There were 4 bikes in the car we boarded on an 8-car Dublin-Peasanton train out of SF last night (TH, 5-124) at 10:20 PM. Accommodating our 2 bikes was a simple matter of courtesy and communicating: we asked a couple of standing passengers to move out of the marked bike space and they helped us out. Asking someone to vacate a flip-down seat in the new cars will be just as simple as long as BART passengers are cordial and civil with each other, which is usually the case, even on crowded SRO trains with and without bikes on board. Ending the bike blackouts will also be just as simple–as long as all passengers, including bicyclists use common sense and common courtesy, and do not overcrowd any BART car (a rule applying equally to ALL BART passengers at all times).